HOT DEALS: Grab a flatscreen TV bargain in the Argos sale, ends January 3 | What Hi-Fi? Plus there's a LG BD550 Blu-ray player for £89.99 (save £60) and a Toshiba RD100 DVD recorder with 320GB hard drive for £179.99 (was £269.99). 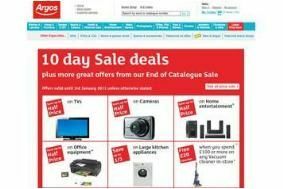 Full details of all offers on the Argos sale website.